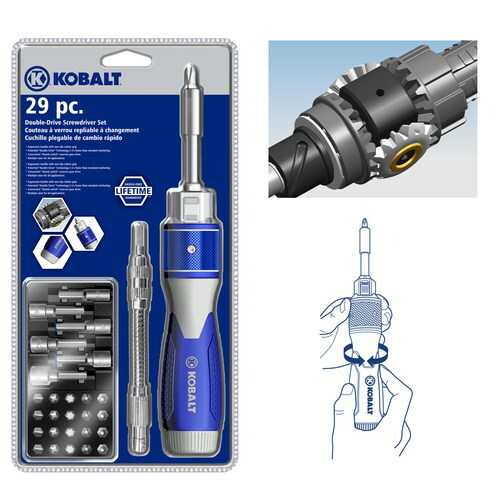 A clever screwdriver called the Kobalt Double Drive sold out over the US winter holiday season. As one twists the hand to and fro, the screwdriver turns continuously in one direction, cutting screw-driving time almost in half. Surgeons are excited over medical versions, as even small savings in operating table time are golden. KiteLab Group noted this device last year as an attractive experimental AWES transmission element for rectifying pumping kite inputs to rotating loads (like geared generators). It contains a classic differential gear, and equivalent devices could be quickly developed at even megascale from COTS gearsets. This method reduces the need for flywheel-mass and other power-smoothing. One still needs double-pumping or elastic-return, and usually multi-gearing, for practical electrical generation by kites. The inventors of the Double Drive screwdriver presumably did not envision reverse-driving a differential-gear-based tool by kite. The differential-gear AWES idea is claimed as coolIP. The popular screwdriver will soon again be sold via Lowe's online, and later once again stocked on store shelves, but an impatient experimenter can cobble up an AWES demonstrator from stock RC car parts, or a salvaged differential such as a rider mower, car, truck, or tractor transmission.